Dirty Washing is an installation that draws upon the idea of British etiquette, and the caution of it not being wise, polite, or acceptable to air one’s dirty laundry in public. The work presented a domestic scene, yet an air of danger and violence. Mayhew smashed mirror (representing seven years bad luck for the superstitious) and draped and pegged it precariously over the washing line. 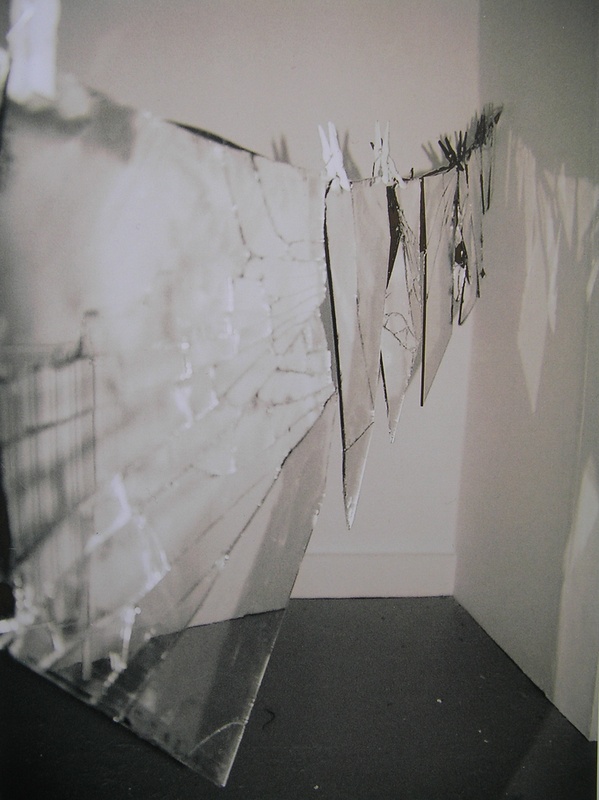 The broken mirror contorted into different shapes as it hung, delicately suspended on the line, and as one stoof before it one’s reflection was equally distorted and fragmented, as were the reflections that the changing natural light in the space projected onto the walls beyond and around the viewer. These reflections highlighted the viewer’s relationship with nature and their environment, and the need to move around the space in order to capture different aspects of a whole, it being impossible to truly reflect a three dimensional form in something that is two dimensional.